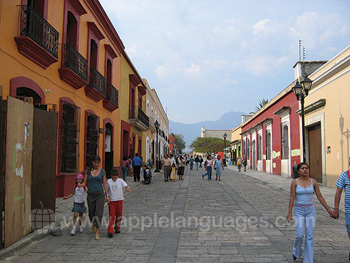 If you’re looking for the ‘undiscovered’ Mexico, then learn Spanish in Oaxaca! With ancient Zapoteca sites, beautiful colonial buildings, and great nightlife, Oaxaca offers the perfect blend of both ancient and modern Mexico. Oaxaca’s zócalo, or main square, is a firm favourite with our students – it’s the ideal place to relax and try the local drink mezcal, made from cactus. 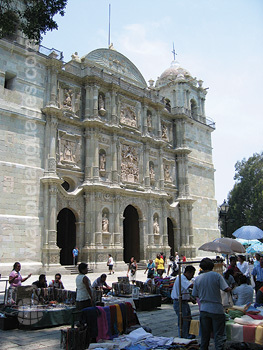 Whilst you’re there, don’t miss the magnificent displays of food and craftsmanship at Oaxaca’s Saturday market. You’ll find over 700 stalls offering exotic fruit, colourful pottery, hand woven rugs and hot food and drink. Celebration is taken very seriously in the city, and with festivals throughout the year, it’s more than likely that you’ll see some music and dancing during your Spanish course in Oaxaca! Easter, Christmas and the Day of the Dead (November) are all key festivals in Oaxaca, whilst the Guelaguetza Festival, held in Oaxaca’s amphitheatre in July attracts visitors from Mexico and beyond! 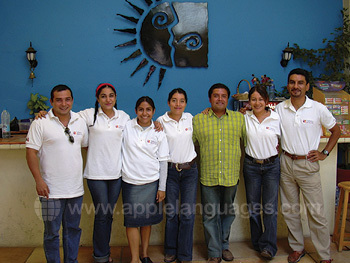 The staff at our Spanish school in Oaxaca are very friendly, so you’ll settle in in no time! Our school is ideally located, just around the corner from the main square and countless restaurants, shops and Internet cafes. Inside our school, there are 12 classrooms, plus free Internet access and wireless Internet connection. 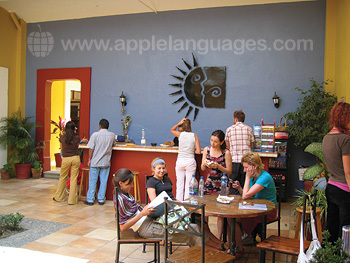 You’ll love our school’s internal patio – it’s great for enjoying Oaxaca’s fantastic weather. You can choose from a range of Spanish courses at our school. Our Intensive (20 Spanish lessons) and Super Intensive (25 lessons) courses are very popular with students, and both have a maximum class size of just 8 students! Our school also offers one-to-one courses for students who want to make as much progress as possible during their stay. To really improve your Spanish, stay with one of our school’s carefully selected host families. Oaxacans are known for their hospitality, and you can choose from bed and breakfast or half board (2 meals/day). Students can also stay in the school's colonial style residence which is located just 10 minutes walking distanace away from the school building. The residence has 10 rooms, each equipped with a private bathroom and students staying here also have access to free wifi Internet access, a large patio, a common room where you can watch TV and a shared kitchen where you can prepare meals. At the weekends, you can join one of our school’s optional excursions to the beaches of the Pacific, local waterfalls, and enjoy activities such as mountain biking, hiking, rock climbing and paragliding. To get to Oaxaca, simply fly to Oaxaca Airport. 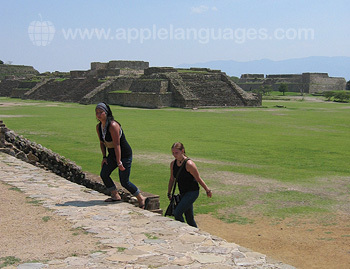 Then, take an airport taxi or shuttle to Oaxaca. Airport transfers are also available on request. Just ask us for details! Great school and teachers. organise extra curricular activities also, great fun. Iwas stying in a hostel for my first week - cold showers though.